Mounted on masonite and unframed. 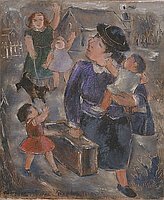 A woman in blue dress and hat, holding baby and purse in left arm, suitcase in other hand, looks over her right shoulder back at Caucasian woman and girl waving goodbye in upper left corner. 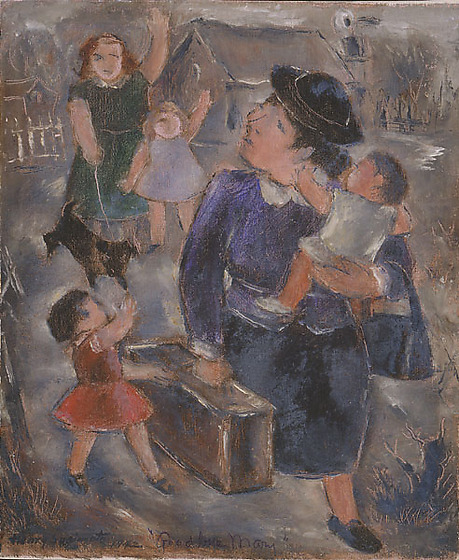 Walking next to her, at left front, a young girl in red dress with left hand on suitcase, waves with right hand and looking over left shoulder. The woman in the background wears a green dress and waves with her left hand while holding a dog on a leash with her right hand. A young blonde girl stands next to her on the right wearing a light blue dress, also waving goodbye. In background, are what appears to be farmhouses, trees and a windmill.